3 Bedroom Semi Detached House For Sale in Manchester for Offers Over £300,000. This beautifully presented, spacious semi-detached is perfectly positioned in the prestigious Roe Green. Offering stunning space throughout the property has been extended across the rear and has approved planning permission for a further double storey extension, providing an additional bedroom. Featuring a hallway, spacious lounge with a bay window and doors through to a great size dining room with study area which open into a modern fitted kitchen with integrated Neff appliances. To the first floor are three well proportioned bedrooms and a contemporary bathroom with a three piece suite. 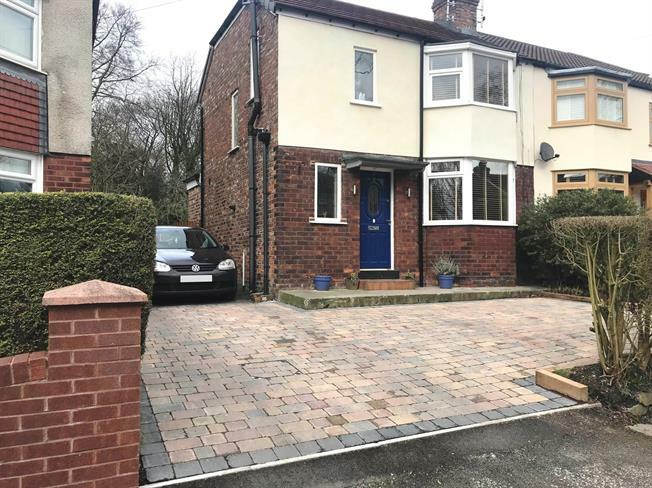 Externally there is a front garden with a blocked paved driveway for multiple vehicles. To the rear is a stunning size rear garden with patio seating area and laid to lawn. Further benefitting from gas central heating and double glazed windows throughout, viewings are highly recommended to appreciate the quality of home on offer! Hardwood front single glazed door. Double glazed uPVC window with obscure glass facing the front. Radiator, carpeted flooring. Stairs to first floor. Hardwood double doors leading into the dining room. Double glazed uPVC bay window facing the front. Radiator and gas fire, carpeted flooring. Double glazed uPVC bay window facing the rear overlooking the garden. Radiator, laminate flooring, spotlights. Study area to the rear and open access to the side into the kitchen. UPVC French double glazed door, opening onto the garden. Double glazed uPVC window facing the rear overlooking the garden. Radiator, laminate flooring, under stair storage cupboard, spotlights. Granite effect work surface, wall and base units, one and a half bowl sink with mixer tap and drainer, integrated Neff electric oven, integrated Neff gas hob, stainless steel extractor, integrated dishwasher, integrated washing machine and fridge/freezer. Double aspect double glazed uPVC windows with obscure glass facing the front and side. Heated towel rail, tiled flooring, part tiled walls, spotlights. Low level WC, panelled bath with mixer tap, shower over bath, pedestal sink with mixer tap.